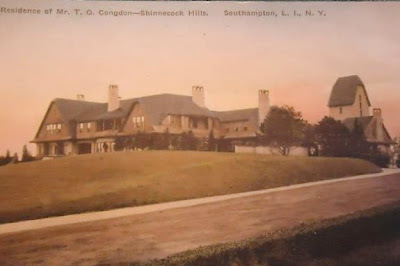 'Andros Hills', the Thomas Gerald Condon estate designed by Grosvenor Atterbury c. 1906 in Southampton. Condon was president of the Southwestern Coal & Iron Company and was involved in mining and railroads out west. Click HERE to see 'Andros Hills' on google earth and HERE on bing. Thomas Comden spent a fortune, reported to be a million pre-income tax dollars, landscaping the grounds, including trucking in a 15" layer of top soil - resulting in the lushness of its vegetation compared to the surrounding area. During the Depression, the property was sold for $17,000. Bing View. Que the usual forecourt lament. However, the winding drive down to Montauk Hwy is praiseworthy and newly added along with the forecout, as neither appear in the Bing view taken from the east during what appears to be a renovation. Also praiseworthy is the estate proportions and organic casualness of the house, ancillary structures and the wooded acreage. Not praiseworthy is my perceived conversion from the original weathered shingle exterior to what appears to be stucco and modernized windows. Bleh. Hopefully, landscaping is the next phase of the recent renovation. The recreation/reinterpretation of what appears to have been an original attached barn/stable/tower is commendable. A good looking house – & I was already a fan of Grosvenor Atterbury. As you rotate & zoom in & out in Bing you can see a huge four-story addition being added to the back of the main house – across the driveway & connected by a second story walkway. I applaud the owners for staying true to the original design & not (at least not appearing to) materially alter the main house. It appears the current owners have the funds & the inclination to fix this place up & luckily for them there is still a nice bit of acreage to frame their very nice house. I’m guessing the front still looks out to the water. I think the shingles have just been painted white. If only they had taken the words of advice offered by – I believe it was Ancient’s aunt – stain, don’t paint; they would have saved themselves a lot of future maintenance. I also prefer the long, winding drive up from Montauk Highway that replaced the previous direct route; & looking at the house again I notice the tennis court is also new … & placed just below the swimming pool … compared to ‘Sandy Cay’ yesterday where the tennis court is just above – I think either works (joke). I am sure ya'll already know this because you have been at this longer than me, but if you zoom in and out and rotate the views on Bing you get during renovation and then after renovation? At first I thought I was going crazy! The water tower here is so good.. If anyone has insight into any of the above please post! Off subject...anyone have any info on an estate named "Sunnyside" on Bayville Road in Lattingtown? Anonymous can you give a specific location of property in question? HPHS....on Bayville Road before "Beaupre" heading north, more towards "Ransom Beach" on the same side of the road as "Beaupre and "Longford". I passed the other day and noticed a red sign with gold lettering "Sunnyside". I googled and there used to be a "Sunnyside" on Center Island, but this was definately on Bayville Road. Also a bit south of "Sunnyside" heading toward "The Creeks" country club seems to be an abandoned pair of enterance columns with I think my be either acorns or pinapples on top...same side of the street...I think I may have seen what estate those belonged to on this site....but can't find through the search engine. Again, no other mention of a "Sunnyside" on Bayville Road, and I can't find it on BING. I mean after "Beaupre" heading north towards "Ransom Beach". Between The Creeks and Ransom Beach....I'll have to drive back that way this weekend and be more exact.